The design of the A8 Plus is surely simple, and pleasant. I would say that Samsung has completely renovated the look of the series, giving the feel of a premium smartphone. The squeeze in glass and metal design discovers its way to the Galaxy A8 Plus. A slab of glass covers the entire body from front to back and top to bottom. The overall frame of the smartphone is marginally taller 158 mm. but it is also marginally thinner than it’s the previous series smartphone. The two 2.5D curved glass slabs are covering a layer of metal which hides the antenna bands very well. The back of A8 with absolutely no outward protrusion of the camera module. Now you might be worried about the back every time you place it. But no need to worry about it. With edges, buttons on the smartphone are perfectly rounded off, marks it a more appealing A8+ device. Samsung A8 Plus delivers IP68 water and dust resistance features. The Samsung A8 Plus has an unusual speaker grille, on the right of the Samsung A8 Plus, above power-lock button. While on the left of the Samsung A8 Plus, there’s a single SIM tray and volume buttons. A 3.5 mm headphone jack and a USB-C port are features in the bottom. An additional SIM and microSD card slot mounted in the bottom. The Galaxy A8 Plus with minor frame drops during a concentrated gaming session handled gaming well. I think the only section Samsung must excel is on fingerprint scanner sensor position. Fingers need to be stretched to reach the fingerprint sensor which is mounted below the primary camera on the rear. Although missing out on the serious curved edges of its premium counterparts. A8+ has packed with slim-line bezels while leaving sufficient space for the dual cameras which is the most unique. The Galaxy A8 plus gets a 3,500 mAh non-removable Li-ion battery but shouldn’t be an issue for most consumers. Samsung has always been recognized for their smartphone technologies and also known for developing the best AMOLED displays. Samsung A8+ has a gorgeous 5.99-inch Super AMOLED panel is undoubtedly one of the best in the bracket. It also supports a microSD card and two SIM cards. The display is very sharp which functions at a resolution of 1080×2220 px with a pixel density of 411 PPI. Given that Samsung does like saturated colors. Even the color tones are not true to life though they were soft to the eye. In short, the display isn’t color accurate though it can be calibrated in the display set up. The Samsung A8+ display gets adequately bright as well as seems pleasant. while watching an HD with no viewing issues when viewing text even under direct sunlight. The Samsung A8+ display settings tab also have some good features like adjusting the icon framing as for your preference. while adding a blue light filter option for reading in the dark ambiance. Overall with my aspect, I liked the Samsung A8+ but of course, the color accuracy issue is counted. Samsung A8 Plus 2018 titles of the dual-front camera, one is of 16 megapixels other is 8 megapixels. Both sensors have an f/1.9 aperture on both the front and rear cameras. Video shooting capabilities are though limited at 1080p at 30fps which they might have extended to 4k. And 16 megapixel rear Camera with an f/1.7 aperture of and PDAF (phase detection autofocus) support. an LED flash. It also supports high dynamic range (HDR) imaging and Faces Detection. With Live focus mode, Added flair and fun to your selfies on the Dual Front Camera. It actually blurs the background, adding bokeh-effect that a serious point to note, so you and your mob can stand-out. Subsequently, you can also readjust the focus to your preference. This is no the end but there are still some features in bucket like Beauty effect pre-photo, selfies, and wefies. Despite missing out on the curved edges of its premium counterparts, the A8 and A8 Plus both pack slimline bezels. while leaving enough room for the devices’ most unique feature – a front-facing 16 MP + 8 MP dual-camera. Using Samsung a8 plus case will help to protect your Samsung a8 plus camera lenses every time landing solid surface. Samsung has always been a leading smart smartphone company in terms of shipping the latest operating. here it ships with Android Nougat 7.1.1. Samsung said, that the Samsung Experience launcher holds really great for regular day to day use. Animations are fluid and smooth. with lots of innovative customizations such as fingerprint gestures, smart capture and dual account support for certain messaging apps. There are some Regular features like multi-window support and a one-handed mode. so this is also the part of the software. What new that Samsung has introduced is a Game launcher for hard-core gamers, which provides a number of options. These options include a switcher and a screen record feature which help to turn off notifications while playing a game. Samsung’s A8 Plus provides similar Samsung’s Exynos 7885 octa-core chipset along with a Mali G71 GPU to handle graphic-intensive work. the processor features 6-lower-powered Cortex A53 cores clocked at 1.6 GHz and 2-Cortex A73 cores clocked at a 2.2 GHz. That’s what provided with the Galaxy A7. For regular application tasks and certain heavy apps are being handled by the chipset with relative ease. but need to worry when you are playing heavy lifted games. The expected performance can’t be delivered from Samsung, as comparing it with rival’s flagship smartphone at the excepted price range. Samsung does comprise of 6 GB of RAM and 64 GB of memory storage. This works marvels for using applications in split-view mode and multitasking, but the battery doesn’t sustain for a longer period. Temperatures remain relatively cool under stretched gaming sessions. 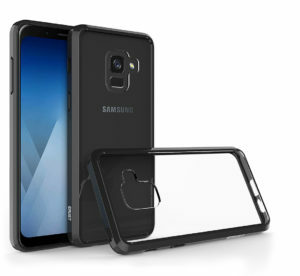 Crust Samsung A8 plus Case is Ultra Slim Matte. As the title suggests, it doesn’t weigh much and it’s thin. It comprises of an anti-scratch coating and has raised bumpers to keep the screen safe. Cover weight of 70gms, the Crust Samsung A8 plus Anti Slip Transparent Cover is the perfect goal for case lovers. The Crust case isn’t fully transparent though. The edges are susceptible to tinkles more frequently are protected with a TPU bumper. Also Check our exclusive designs for Samsung S8 Plus cover, Samsung Note 5 Cover, Samsung Note 8 cover, Samsung 7 Edge Cover. If considered for a case with a textured back, with the Samsung A8 plus Back Case, that the end. This case comes along with anti-shock corners and web-patterns to deliver 360°protection. The Samsung A8 plus Back Case with the shockproof feature is available in two colors —Black and crystal clear. The Samsung A8 plus Back Cover is royal, flexible, built to boost the look of your Samsung A8 plus. It weighs around 31.8 grams because of it’s a silicon case. Moreover, its lips are raised to ensure that the screen remains protected from any scratches. Crust Samsung A8 Plus cover Case covers are usually last a long time and are strong. Unlike armour cases, the Crust Samsung A8 plus Case Back Cover for the Galaxy A8+ is slim. yet it’s fully capable to take on the elements of nature. Crust Samsung A8 Plus cover case fits warmly to your Samsung A8 Plus this a great feature of this case. These features you can also grab for your iPhone X Cover, Oneplus 6T Cover, Honor 9 Lite cover. Crust Samsung A8 Plus cover has the dual-layered protective fit armour protection. measured as one of the best Samsung Galaxy A8 2018 covers and cases. The interior equipped with shock-absorbing TPU and soft material outer core is hard-shell plastic (external body). this provides extreme protection against shocks and drops. Samsung A8 Plus the cover is designed for a good grip which escapes the risk of unintentional slips. the corners of the Samsung A8 Plus cover features double-thick TPU for superfluous enhanced safety measure. The Crust Samsung A8 Plus cover bumper and an ultra-slim styled transparent case are perfect for displaying the original look. and safeguarding of your smartphone. Specifically designed for Crust Samsung A8 Plus cover is a decent protective case. This safeguards your smartphone from Scratches, Fingerprints, Abrasion, Specks of dust, and Collisions. This best Samsung A8 Plus case is made up of carbon fibre Soft TPU material which is environment-friendly. The drop resistance air sack sink guards your smartphone against the damage caused by dropping bumps and shocks. The Samsung A8 Plus case offers max. Coverage, it covers the back of your smartphone and edges. The Samsung a8 plus back case looks stylish and elegant and precisely suits the shape of your smartphone. Due to thin gripping, Samsung A8 Plus cover helps to access the button control and ports of the smartphone easily. Samsung a8 plus back case helps in heat dissipation in the course while you are using your smartphone. Also, the wire-drawing and carbon fire pattern look trendy and premium. The Samsung A8 Plus cover case minimizes the risk of damage from shocks and drop. and is anti-shock moisture proof, wear resistant. For precise design, the laser-cut technology used for a clear opening allows to interference-less access all the ports and buttons. Get a Crust BT56 Car Bluetooth FM Transmitter with Q.C 3.0 Charger a smart Bluetooth device for your car. At Crust, your search for Samsung A8 Plus back cover & case comes to an end. as we have a combined massive collection of Samsung A8 Plus back cover & case. that comprises a superior quality and at reasonable cost which again makes product reliable and fulfills very requirements of users. Secondly, the smooth online shopping experience with our product filter helping to reach your desired product easily. we understand needs for Samsung A8 Plus back cover & case. On order, we ship the Samsung A8 Plus back Cases to almost anywhere in Pan India. through our courier partners such as FedEx, Delivery express, Bluedart and many more. We track your Samsung A8 plus back Cases until it reaches you. 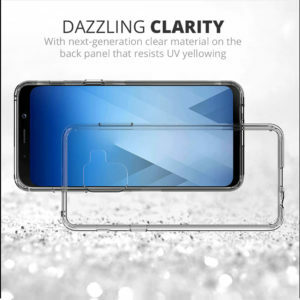 Trending crust Samsung A8 Plus back covers for Men and Women around the year. there are many offers rolling online our website to provide our users with a trendy and satisfying result. Although, the Samsung A8 Plus back cover is lightweight with sleek in design with a rigid surface. this offers a good grip on your cell phone and will look rich and expensive. So why to worry, grab one for your Samsung A8 Plus back cover today and we will make sure to provide you the finest and durable case cover for your Samsung A8 Plus. Protect your Samsung A8 Plus with impressive style statement, also check out our stylish silicon matte texture designer cover for (other Samsung products) everything online only on Gocrust.com. Design of Samsung A8 Plus cover case is being done considering the dimensions of the Samsung A8 Plus phone itself to give an immersive feel as they are one. Get ready to grab your favorite case and covers today.